CaterkillerMedia:Sonic1 MD US SonicJam manual.pdf, called Nal (ナール) in the Japanese manualMedia:Sonic1 MD JP manual.pdf, is a caterpillar-esque Badnik from the 16-bit and 8-bit versions of Sonic the Hedgehog found in Marble Zone and Scrap Brain Zone that crawl along the ground. Spikes cover its body, leaving only one weak point—the head. Trying to destroy it from any other angle will make the Badnik fall apart and send the pieces flying. Caterkiller also appears in the 2012 remake of Sonic Jump in Mountain Zone on the lower platforms. Caterkiller appears again in both versions of Sonic Lost World with a more cartoonish style. In the Wii U/PC version, regular-sized ones appear in Windy Hill Zone 4 and Silent Forest Zone 3 and can only be hit in the head with a Homing Attack, with much bigger versions burrowing through planetoids and creating shockwaves in Sky Road Zone 1. The giant ones are pink instead of purple and sport feminine eyelashes, and are defeated by multiple Focused Homing Attacks or six Flying Kicks. 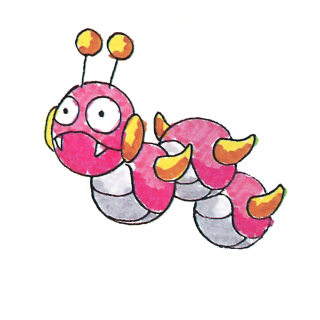 In the Nintendo 3DS version, regular Caterkillers are dealt with by stunning them with a Somersault Kick, then finishing them off with a Homing Attack, while a giant Caterkiller chases the player at the end of Windy Hill Zone 1. Caterkillers also appeared as common enemies in the Windy Hill stage in Sonic Runners, sporting the same design from Sonic Lost World. Caterkiller in Sonic the Hedgehog (16-bit). Caterkiller in Sonic the Hedgehog (8-bit). Caterkiller in Sonic 3D Blast. Giant Caterkiller in Sonic Lost World Wii U. Giant Caterkiller in Sonic Lost World 3DS.